When you're researching how to make clumpy granola, you're probably finding a lot of the same cooking hacks: using egg whites or adding sweeteners like honey or maple syrup. 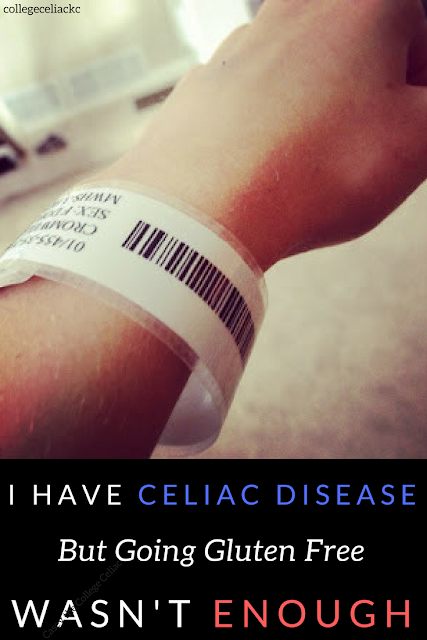 But what if you want a healthy granola recipe that is full of clusters but free of allergens? That's where this vegan gluten free granola recipe - with a few surprising ingredients! - comes in. Just imagine digging into thick granola clusters made entirely with healthy ingredients like buckwheat groats, seeds, spices, mashed frozen banana (more on that later!) and shredded zucchini. For an added bonus, this vegan granola also features superfoods like coconut flour, turmeric and cacao powder. In fact, with no refined sugar or oil, there's no reason you can't enjoy this gluten free granola recipe at any time of day! Instructions for Your New Favorite Healthy Granola Recipe! Start by preheating your oven to 425 degrees Fahrenheit and by taking your frozen banana out of the freezer. Then combine all of the dry ingredients (everything until the dates) in one large bowl. Mix well. Next, shred the dates with your fingers and incorporate. Once you've created your dry and sticky vegan granola base, you can add the binders that will make your gluten free granola clump up. 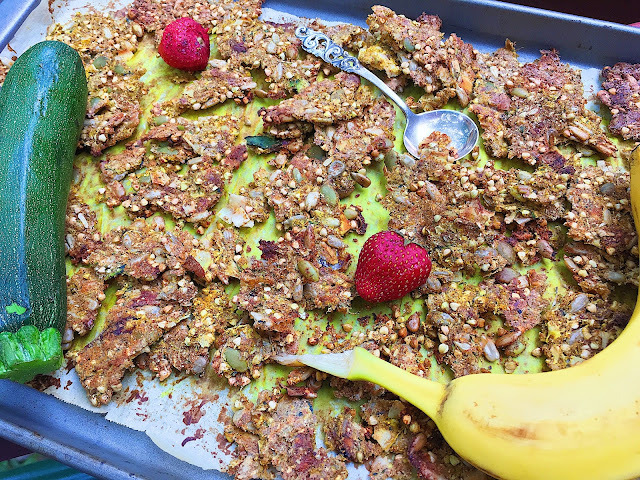 You're probably wondering, "Why do I have to freeze my banana for this gluten free granola recipe?" On their own, mashed ripe bananas create some decent granola clusters. However, if you want really clumpy granola, frozen banana thawed just enough to be mashed can lead to even better granola clusters. Since you took your banana pieces out at the beginning of your granola party, they should be mashable. If not, defrost your banana pieces in the microwave for 10 seconds. Then, mash your banana slices against the sides of the bowl with a spatula and incorporate the thick purée into the rest of your gluten free granola recipe. Now it's time to get your arm workout with my second secret weapon: zucchini or yellow squash. When grated, squash turns into a flavorless binder that will help hold all of your other gluten free granola ingredients together. All you need to do is grate your zucchini/squash over your mixing bowl, preferably into very small pieces. By the time you finish mixing in the shredded squash (making sure there are no large bundles left), your mix should be relatively wet and thick. If you still have some dry portions, add water (one TBSP at a time) and mix. 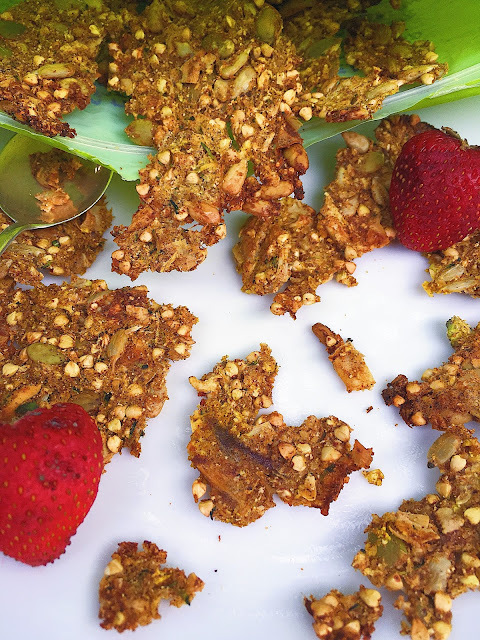 You've made it - it's time to bake your healthy granola recipe! Line your baking pans with parchment paper and transfer the granola to your trays. For crunchy but thin vegan granola clusters, press the granola down firmly against the tray with your spatula. For thicker clusters, just don't spread your granola as thinly. For the ultimate clumpy granola, let your vegan gluten free granola cool for a few hours before breaking it apart in your hands. Then, store your granola in a sealable bag and devour! I often eat this gluten free granola straight from the bag, but it's also a delicious topping for vegan smoothie bowls, yogurt parfaits or even ice cream. This gluten free granola is also a great snack idea if you're going on a long summer road trip! The best part? You can use my "clumpy granola" tips and tricks on any of the healthy granola recipes I've previously shared. Lovin' summer berries? Dig into my Berry Coconut Granola. Want to sneak even more vegetables into your vegan granola? Try out my Green Smoothie Granola. 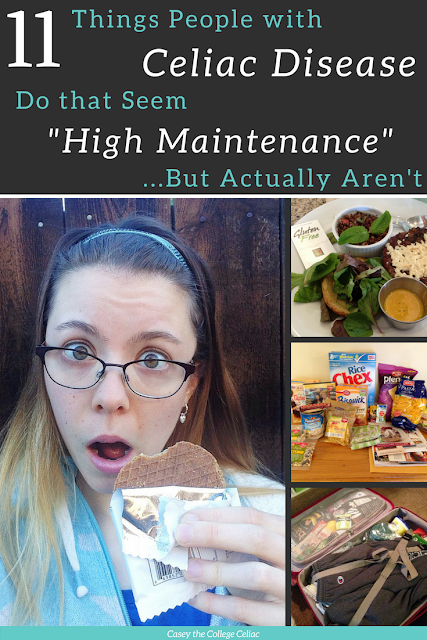 And, of course, no chocoholic can turn down my Cacao Crunch Granola! To make any of these gluten free granola recipes full of granola clusters, just use a frozen banana and layer your unbaked granola as thick or thin as you want the final product to be. Love this recipe? 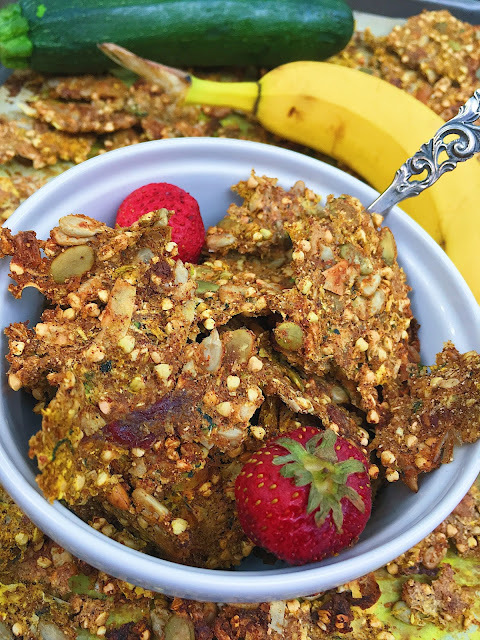 Tweet it out by clicking here: "#Glutenfree granola that tastes like #dessert but is full of #superfoods & #veggies? Yes please! http://bit.ly/2sDJThi via @collegeceliackc"
When you're learning how to make clumpy granola, the most important trick is finding out what trick works for you. If egg whites or refined sugar agree with your body, those cooking hacks are easy ways to create granola clusters. 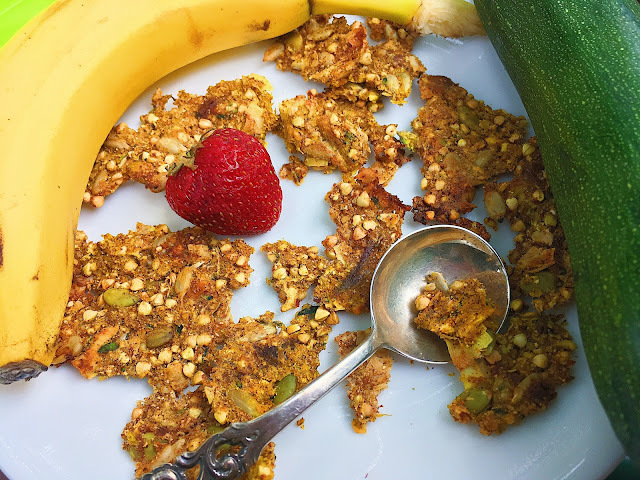 But if you want to make the clumpiest vegan gluten free granola out there, frozen bananas and zucchini are the most effective - if not the weirdest - secret I've found! But, like they say...sometimes fact is stranger than fiction. And it's definitely a fact that these gluten free granola clusters are just as delicious as they are allergy friendly! Craving a clumpy, healthy granola recipe that is also allergy friendly? This gluten free granola recipe is not only full of clumpy clusters, but also lots of superfoods and hidden veggies! Whether you're looking for a gluten free breakfast or a healthy dessert, this vegan granola recipe is just what you need. *NOTE* For the thickest, clumpiest granola clusters, you'll need pre-frozen banana slices. If you don't have a chopped banana chillin' in your freezer, peel, chop and freeze one banana in a plastic bag at least a few hours before starting this recipe.1. Start by preheating your oven to 425 degrees Fahrenheit and by taking your frozen banana out of the freezer. Then combine all of the dry ingredients (everything until the dates) in one large bowl. Mix well. Next, shred the dates with your fingers and incorporate.2. Since you took your banana pieces out at the beginning of your granola party, they should be mashable. If not, defrost your banana pieces in the microwave for 10 seconds. Then, mash your banana slices against the sides of the bowl with a spatula and incorporate the thick purée into the rest of your gluten free granola recipe.3. Next, grate your zucchini/squash over your mixing bowl, preferably into very small pieces. By the time you finish mixing in the shredded squash (making sure there are no large bundles left), your mix should be relatively wet and thick. If you still have some dry portions, add water (one TBSP at a time) and mix. 4. Line your baking pans with parchment paper and transfer the granola to your trays. For crunchy but thin vegan granola clusters, press the granola down firmly against the tray with your spatula. For thicker clusters, just don't spread your granola as thinly. 5. Once your gluten free granola is laid out, pop your trays in the oven for around 35-40 minutes, turning halfway.6. For the ultimate clumpy granola, let your vegan gluten free granola cool for a few hours before breaking it apart in your hands. Then, store your granola in a sealable bag and devour! How do you like your granola? What's your secret to clumpy granola? Tell me in the comments! I've never thought o using squash in granola! This look delicious! Omg this is the best recipe ever! I'm so going to try this! Thank you for sharing this!! Thanks for the kind words, Theresa! ENJOY! Your recipes are always so interesting! Can't wait to try this one too. This looks really delicious. I've been wanting to make my own granola so I'll definitely consider this recipe. Thanks Casey! Thanks Kasia! If anything, this recipe can give you a great base for you to work off of when creating your own granola! Such a great idea! I love that it uses squash and bananas. What a healthy granola idea! Thanks Mindy! Have a great week! This looks awesome. And I'm on a granola kick lately, so perfect timing! I love the idea of using banana and zucchini here! So unique and sounds yummy! Thanks Dominique! Have a delicious week! This looks delicious! Sounds like a great way to sneak healthy foods in to your diet too. I would have never thought to use squash as a binder! This looks amazing. I would have never dreamed of zucchini or squash in granola! This looks delicious! I love homemade granola, but have never thought to make it with squash before! Glad to give you a new idea to experiment with! This is a great way to include for veggies and I never would have thought about it. Great job! Thanks for the kind words, Marian! Healthy granola recipes are always great, Coconut is one of my favorites so I'm looking forward to giving this one a go. Glad to hear! Coconut is a favorite of mine too! What a delicious granola recipe! I can't get enough of homemade granola. I'm SUCH a homemade granola addict! Enjoy! Hope you love it as much as I do! Oh my goodness is this for real!?! When I make granola I ALWAYS try to get it to be clumpy, and only maybe once have I some-what succeeded (the typical egg white "trick"). But THIS is unique. I so can't wait to try this. You've got all my foodie curiosity raging.